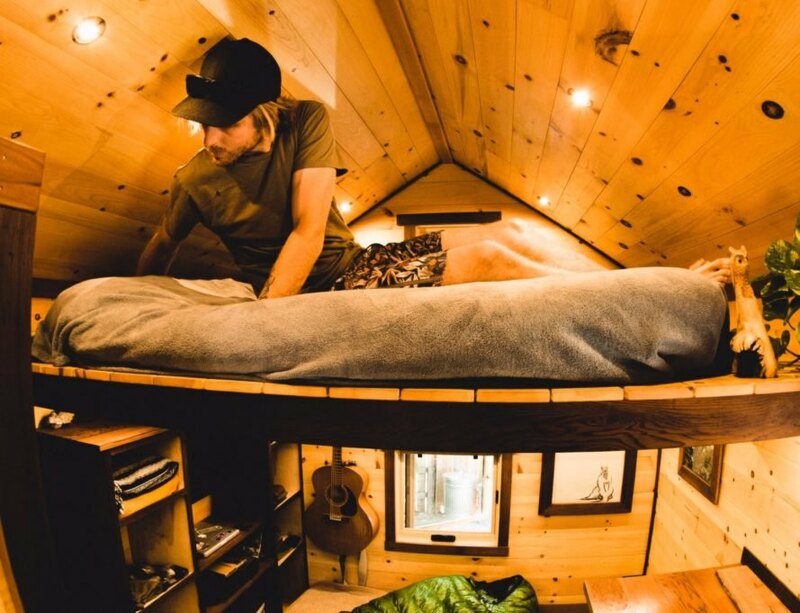 We’ve seen a lot of tiny homes over the years, but the Acorn has to be one the most adorable designs we’ve ever come across. 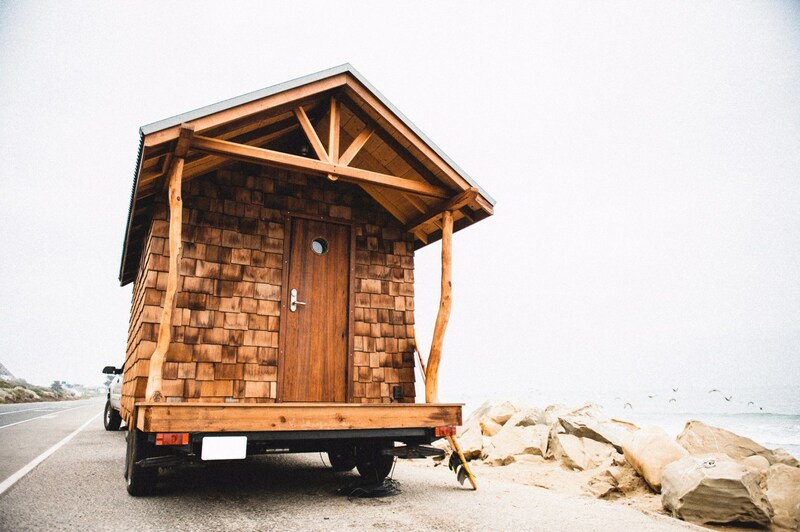 Created by the team from Ojai-based Humble Hand Craft, the sweet tiny home on wheels is built from reclaimed wood and felled trees, including the western cedar shingles that were salvaged from a mansion in Montecito, California. At just 16 feet long and 8.5 feet wide, the Acorn is one seriously tiny home on wheels, but its strategic and space-efficient layout makes the interior seem much bigger. Built on a trailer of the same dimensions, the Acorn takes us back to the basics of traditional cabin design with its warm facade of cedar shingles, a corrugated metal roof and a welcoming front porch. 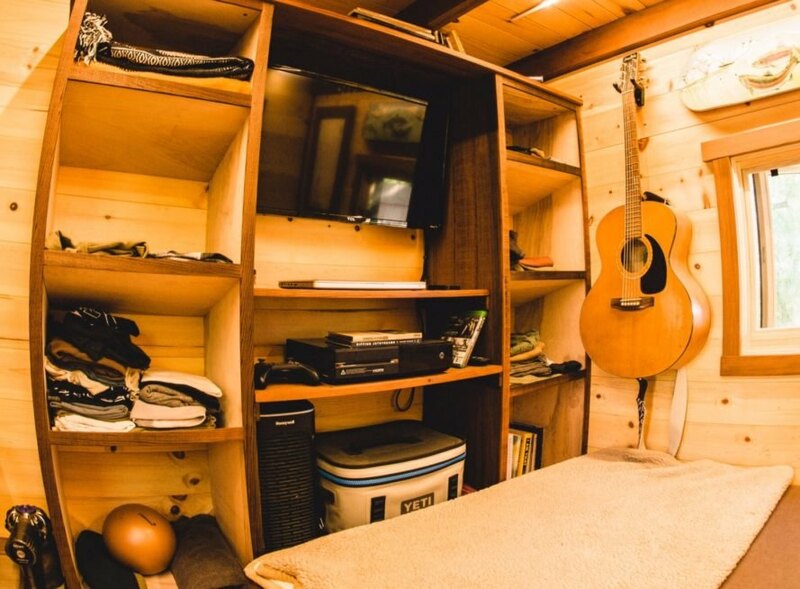 According to the builders at Humble Hand Craft, like most of their cabins, the Acorn was made out of wood salvaged from various sources. The Western Red Cedar shingles used to clad the small structure were reclaimed from an old mansion in California. The porch posts were made out of a dead tree that had fallen near one of the builder’s favorite hiking trails in Ojai. Much of the cabin’s interior, such as the trim and the front door, were made out of reclaimed redwood salvaged from a 5,000-gallon wine barrel found at a vineyard in Santa Cruz. The all-wooden interior creates a homey living space, enhanced with an abundance of natural light. A space-efficient layout was essential in designing the interior. To create more living space on the ground floor, a sleeping loft was installed on a platform. The living room, which is big enough for a small sofa and table, is kept warm and cozy thanks to the small wood-burning fireplace. The kitchen features a beautiful redwood countertop finished with a natural bio resin as well as plenty of storage and shelving to avoid clutter. 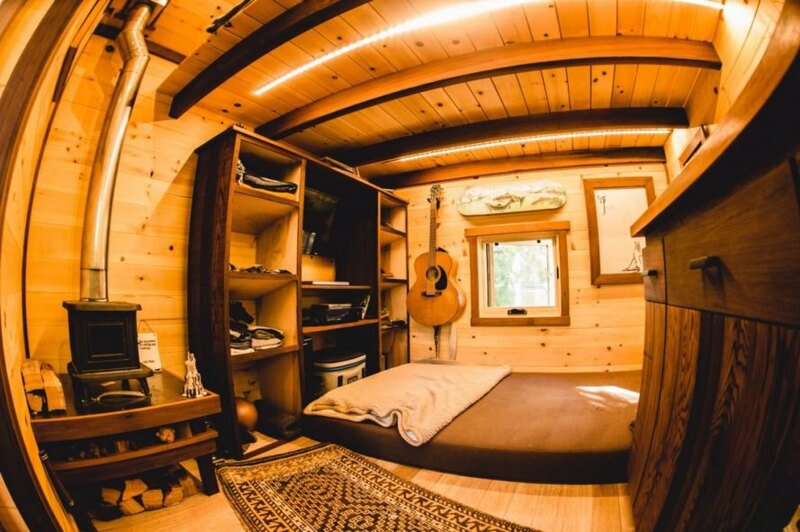 Humble Hand Craft built the Acorn Tiny Home out of reclaimed wood and felled trees. The home is made out of several types of wood salvaged from different sources. 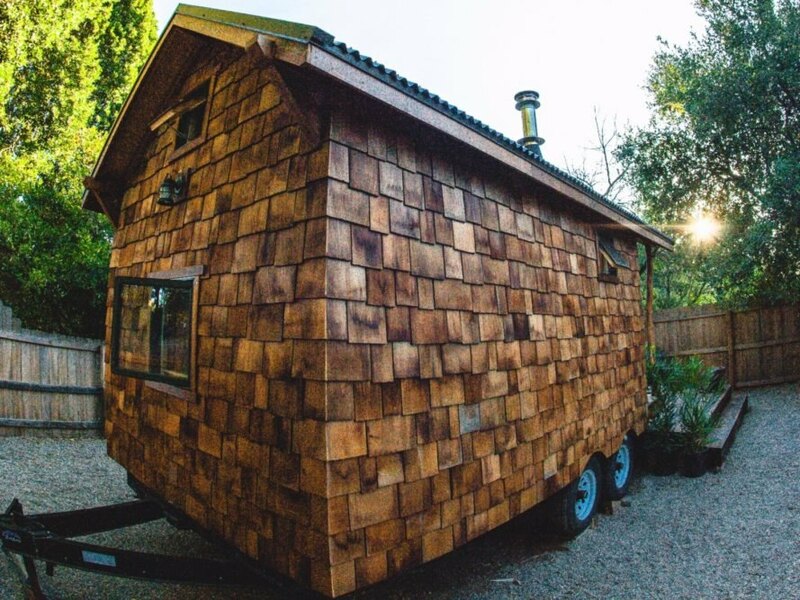 The tiny home's shingles were made out of reclaimed wood from a mansion. The wooden interior exudes a cozy, welcoming vibe. The interior is compact, but functional. The home is equipped with plenty of storage space. A sleeping loft creates more space on the ground floor. 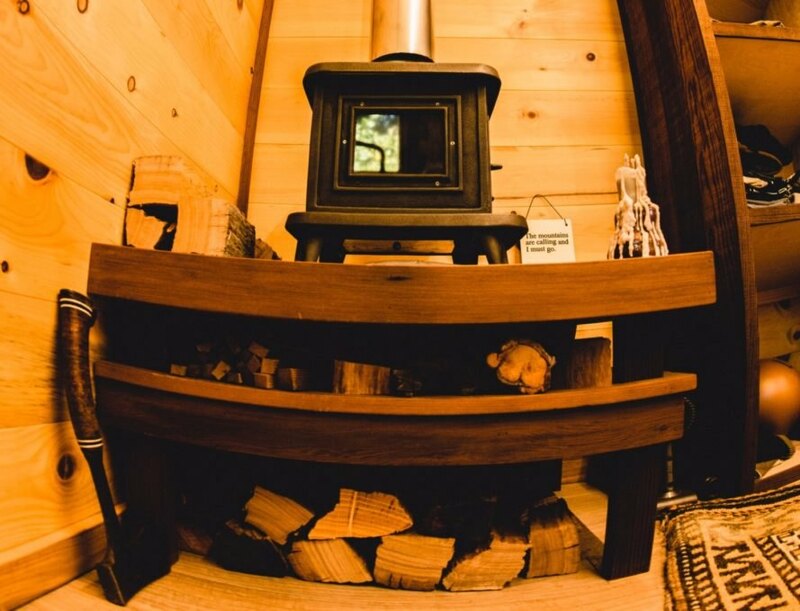 A wood-burning stove keeps the tiny home warm and toasty. The kitchen space has custom-made counters and cabinets. A stand-up shower is big enough for a tall person. The kitchen has a round sink and plenty of windows. 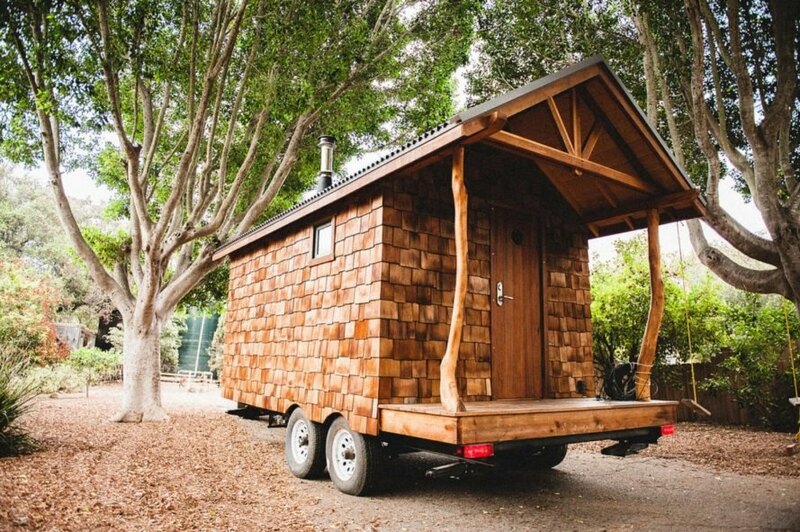 The Acorn was built on a tiny trailer for easy transport. 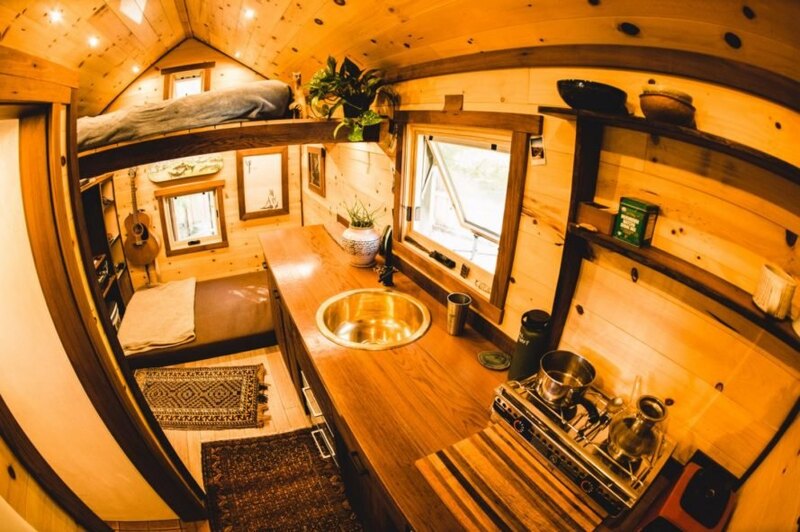 The Acorn Tiny Home is only 16 feet long.